My Occasional Blog: Peace In Our Time? There was a lot of activity in the Red Shirt camp today. The day started with multiple memorial services to honor those killed in the violence one month ago on April 10 and ended with a possible deal to end the standoff that has paralyzed parts of Bangkok since March 12. 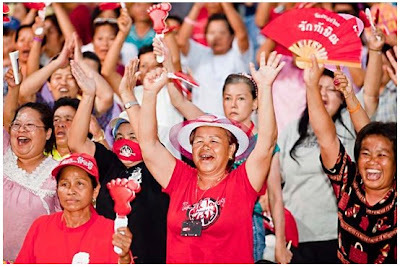 Last week, Thai Prime Minister Abhisit Vejjajiva put forward a five point “Road Map for Reconciliation” and said that if the Reds accepted it he would dissolve parliament early and call elections later this year. The Reds have spent the last week mulling over the PM’s offer but each day giving broad hints that it might be acceptable. Tonight they more or less formally accepted the deal with some caveats of their own (they’re calling it a Red Map). They want their TV station, People’s TV, turned back on and they want Deputy Prime Minister Suthep Thaugsuban turn himself into police for his role in allegedly ordering the security forces attack on Red Shirts protestors on April 10. When the Red Shirt leadership announced their Red Map from the stage, the crowd started cheering enthusiastically. I think everyone is ready for this end. Also, many of the Red Shirts are farmers and with the rainy season just around the corner they need to get home to their fields and rice paddies. Shortly after the Reds made their announcement, Suthep announced that we would meet with police Tuesday morning to discuss his role in the April 10 crackdown. The timing makes me think there was a deal in place. If a deal wasn’t in place, the whole map could still collapse over semantics. The Reds want Suthep to turn himself in to face justice. Suthep has agreed to meet with police. They’re not exactly the same thing. With any luck, by tomorrow at this time we’ll know if the Reds and the government have worked something out or if Bangkok is still going to be crippled by the protest. There are more photos today’s Red Shirt developments (including a memorial service for April 10 victims) in my PhotoShelter archive and available from ZUMA Press.